When the TV show DuckTales debuted in September 1987, twenty-six years ago this month, it brought with it the infamous Beagle Boys and their matriarch, Ma Beagle. These were the main antagonists of Uncle Scrooge McDuck and his wards, Huey, Dewey, and Louie. The whole world that DuckTales existed within was born from the pen of Carl Barks, the writer of Walt Disney’s Comics and Stories, with the debut of the pen-and-ink Beagle Boys hailing all the way from 1951. In the book Carl Barks and the Disney Comic Book a quote from Carl says the original Beagle Boys were based on “Capone’s gang and the different bunch of hoodlums around the country,” the kind of criminals that Banks would have read about in the news while growing up. Throughout the 1920s and 1930s, the combined impacts of Prohibition and the Great Depression brought out the worst in society, birthing the likes of Bonnie and Clyde, John Dillinger and his gang, and the Ma Baker Gang. In my Dakota Datebook for today I write about North Dakota’s rare interaction with a famous criminal. 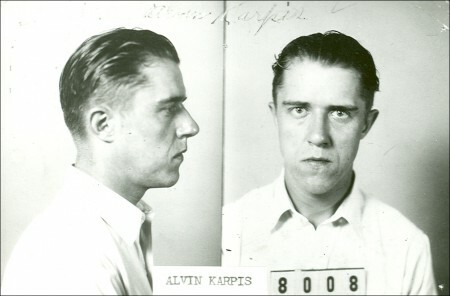 Alvin Karpis was a second-rate car thief when he met the Barker Gang in 1931, and their partnership caused 5 years of mayhem throughout the Midwest. On September 30th, 1932, a couple Barker Brothers, Karpis, and some other accomplices crossed the Red River and robbed a bank in Wahpeton, North Dakota. Nobody was killed (although their hostages ended up the worse for wear), but that wasn’t always the case. The Barkers and Karpis had no problem killing bankers and policemen alike if they interfered with their robberies. According to Barks and the Disney Comic Book, the creation of the Beagle Boys was a response to the previous antagonists in the Walt Disney comics: Huey, Dewey and Louie were the troublemakers, but the idea of showing kids as the rebellious anarchists wasn’t the family-friendly fare that the 1950s wanted. 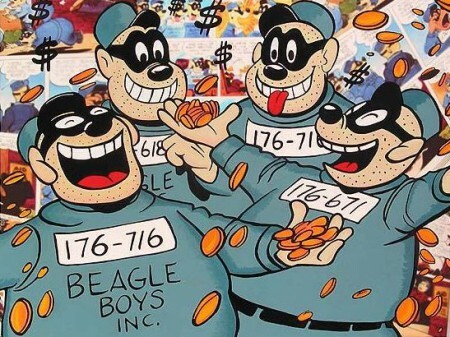 Barks created the Beagle Boys as a source of mayhem that can feel the effects of punishment, unlike the stars of the comic, and lose in the end. Actually, not all of DuckTales’ Ma Beagle Gang originated from Carl Barks’ stories. Ma Beagle herself is a purely DuckTales creation, an evil counterpoint to the heroes, leading her dependents into a life of crime as opposed to Scrooge McDuck’s molding of Huey, Dewey, and Louie into proper citizens of Duckburg. Even in the Walt Disney Comics, the Beagle Boys were obsessively family-oriented. While Huey, Dewey, and Louie were siblings, they lacked parental figures. Uncle Donald and Uncle Scrooge were in charge, and according to the family tree the trio’s father was never even directly shown in the comics. The Beagle Boys of the comics were devoted brothers, with their criminal lineage going back for generations. The addition of Ma Beagle to DuckTales brings that family connection right to the forefront: the Beagle family were the moral opposite of the adhoc family of Duck and McDuck protagonists of the cartoon. In the comics the Beagle Boys were known to be brothers, but aside from their identical resemblance their familyhood was never as explicit as in the cartoon. 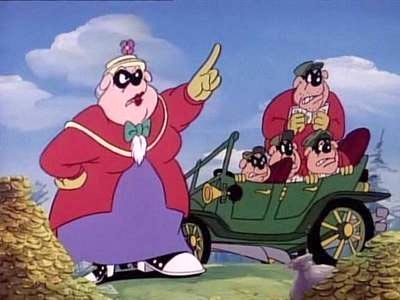 The addition of Ma Beagle as the leader of the gang created a villain, a specific leader that bound the Beagle Boy Gang together as a cohesive enemy. Writing in Ma Beagle as the leader after-the-fact has its roots, probably unintentionally on the part of the DuckTales showrunner, in the original Barker Gang. There’s little, if any, mention of Ma Barker until her death in a FBI shootout in 1935. 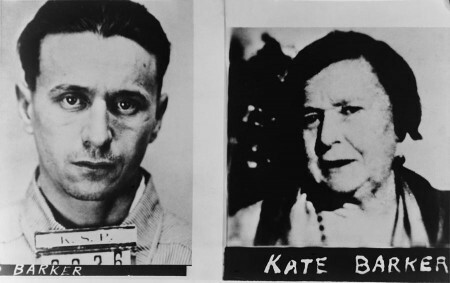 An FBI report from 1936 makes a big deal of Ma Barker’s involvement in her son’s crime, but before 1935 the Barker sons were well known to the police while the phrase “Ma Barker” never appeared in a single newspaper. The gang was regularly called the Karpis-Barker Gang, or just the Barker Gang, but “Ma” wasn’t added until the late 30s. The addition of Ma Barker to the story appears to be the creation of J Edgar Hoover. The Barker Boys had at times moved their elderly mother with them as they traded one hideout for another, but while she was likely complicit in their crimes there is little evidence that she was involved in any, let alone as a mastermind of some criminal empire. One of the Barker accomplices said, “the old woman couldn’t even organize breakfast,” and Alvin Karpis himself described her as just an old lady they lived with. Hoover’s concern was that the press would not be very complimentary over finding out that a 61-year-old woman died in a hail of FBI gunfire. A story was concocted that she had died with a Tommy Gun in her hands — and like Carl Barks’ Beagle Boys, the FBI now had identified their enemy, a criminal leader defeated and justice served. You are currently browsing the The Infomercantile blog archives for September, 2013.